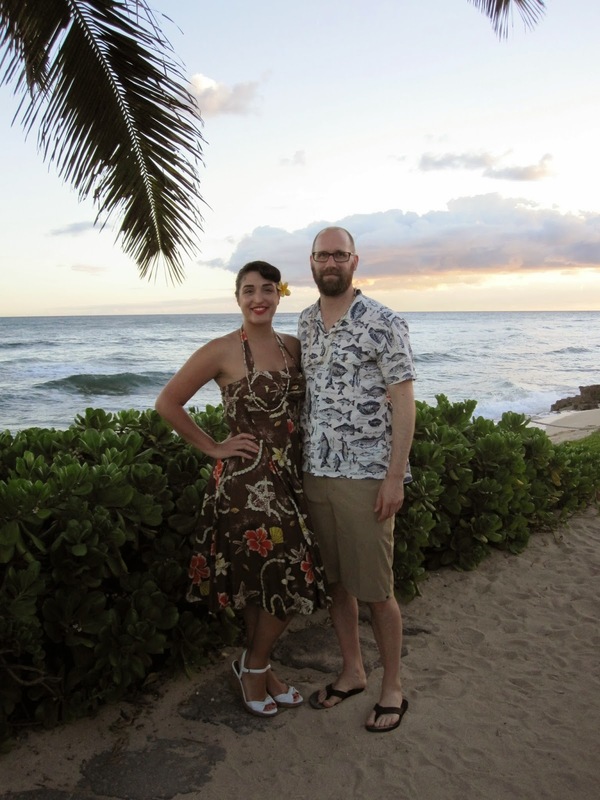 Once back on Oʻahu, Nils and I got the chance to have dinner at a typical touristy lū'au. My aunt won tickets to a lū'au and never used them, so we (along with tourists arriving by the busload) went to Germaines Luau out on the west side of Oʻahu. 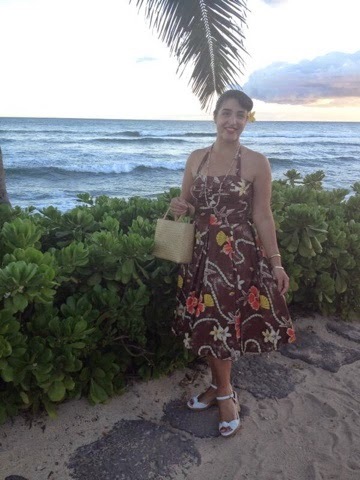 I decided this would be the best opportunity to break out one of my newest vintage dresses: an early 1950's Surf n Sand (an earlier label by Hawaii designer Alfred Shaheen). This dress even has a tag with the name of the original owner on it: a C.J. Reynolds. 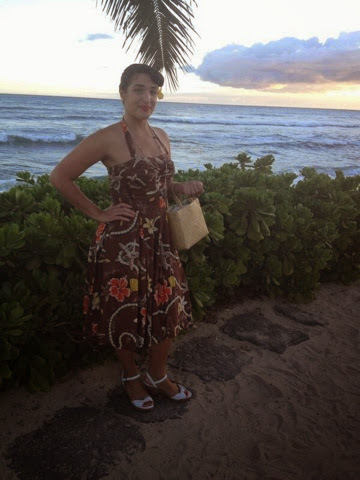 My lauhala (woven pandanus leaf) bag that I got way back when I was 11 was perfect with this dress! Many people love Shaheen's prints for the dazzling colours and prints, and I do too. But they speak to me in a different way. 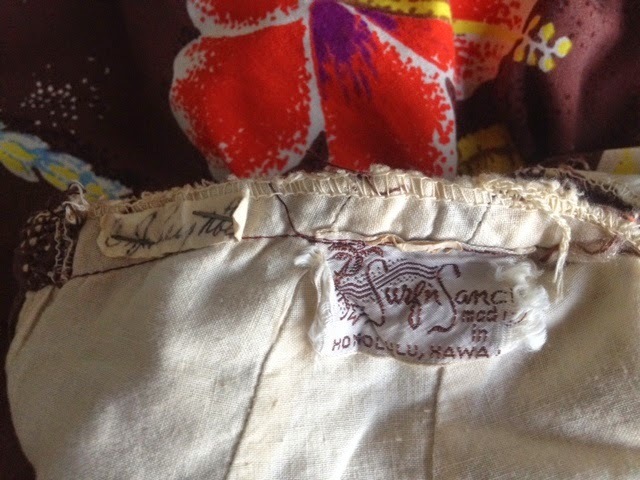 Shaheen used Hawaii as an inspiration in his designs. He didn't just draw just any flowers, he featured hibiscus, plumeria, pikake. The fish weren't just any old fish shape, there were ahi, mahimahi, humuhumunukunukuapuaa. These are the flora and fauna I grew up with and so to me, these dresses are truly special and not just an outfit to match some exoticised, primitive tiki kitsch fantasy. Yup, I just went there. 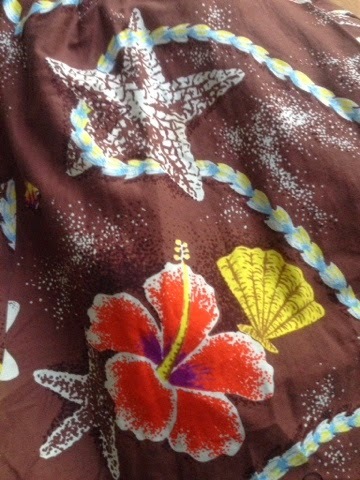 What home looks like to me: This dress in particular includes lei of pikake (hawaiian jasmine), red hibiscus, starfish, and scallop shells. The shells on the dress perfectly matched my sunrise shell earrings. These are rare shells that sometimes wash up on the shore and are popular as jewellery. 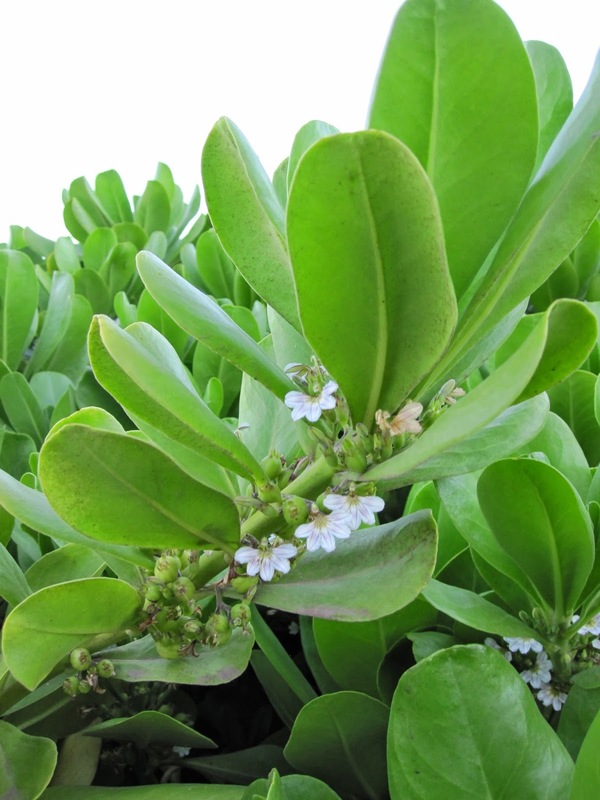 The shell lei I was presented with when we arrived at the lū'au. 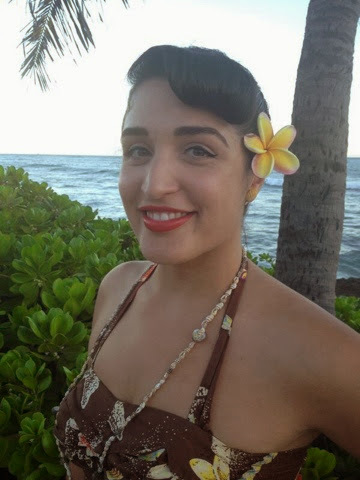 The lū'au included drinks, dinner, and entertainment. After the dinner, which was a combination of Hawaiian and American food, they began the Polynesian dance revue. These tourist lū'aus usually showcase the traditional dances (though perhaps not entirely authentic) of many different Polynesian countries, not just Hawaii's hula, seen below. While I'm not the biggest fan of super touristy stuff, it was fun to do something different and watch some hula!